· The Drone X-Wing T-65 Star Wars is a drone of the Propel brand designed with the characteristics of an X-Wing T-65, one of the best known fighters of the Rebel Alliance. In addition its propellers are located at the bottom and pass completely unnoticed in the air.It is controlled by a 2.4 GHz control station, designed as a command of rebel forces, and includes 3 speeds - reaches 56 km/hour. To learn how to fly, a flight simulator compatible with iOS and Android is available to get you started with this incredible mini-drone. It is designed for you to live true galactic battles. Propel drone is equipped with Li-Fi technology, turning it into a drone capable of firing infrared rays. Just press the radio button and face up to 24 drones at once. Shoot lasers at your opponents, show the Imperial fleet that you are ready to win the battle. If you are hit by one of them, the station vibrates. Take cover! If they reach you three times, the X-Wing drone lands in a controlled way, showing you´ll be out of the game for a few moments. 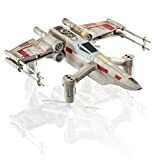 X-Wing T-65 Star Wars drone moves in any direction and also manages to make incredible 360º turns. And as you fly the drone plays the sounds of the Star Wars ship and lights up with its same lights. You already have the Star Wars ship with you! Includes 1 X-Wing T-65 Star Wars drone, 1 2.4 GHz transmitter, 1 Li-Po battery, 1 USB cable and User Manual. The transmitter is powered by 4 AA batteries (not included).